Obesity, diabetes, and metabolic syndrome are reaching epidemic proportions in the United States and around the world. Today, more than 65 percent of adults in the United States are overweight or obese. Poor nutrition and physical inactivity account for some predicted 300,000 premature deaths in the United States each year. Obesity puts people at increased risk for chronic diseases such as heart disease, type 2 diabetes, high blood pressure, stroke, and some forms of cancer. Obesity-related illnesses result in hundreds of thousands of preventable deaths each year in the United States and billions of dollars in health care costs. Fatty liver is a condition wherein large vacuoles of triglyceride fat accumulates in liver cells via the process of steatosis. Steatosis is associated with abnormalities in fatty acid metabolism and lipoprotein metabolism, the accumulation of adipose fat tissue, possible imbalances in glucose, accompanied by the progressive inflammation of the liver (hepatitis). Fatty liver occurs commonly worldwide in individuals with excessive alcohol intake and individuals that are obese. Nonalcoholic fatty liver disease is currently the most common liver disease in the U.S. and worldwide, affecting an estimated 10-24% of the world’s population. In the U.S., the Center for Disease Control reports that currently, approximately one half of the U.S. adult population is overweight (BMI>25) and one quarter of the U.S. adult population is obese (BMI>30). That means, upwards of 29 million Americans possibly have non-alcoholic fatty liver disease. Even more alarming, non-alcoholic fatty liver disease is now occurring among children in the U.S.
Cortisol is a critical hormone with many functions in the body. Cortisol metabolizes fat and carbohydrates into energy, helping to maintain blood sugar levels, and blood pressure. Excess cortisol secreted during times of physical or psychological stress promotes weight gain around the abdominal area. This fat deposit has been referred to as “toxic fat”. Science has demonstrated a clear link between abdominal adipose tissue and metabolic syndrome, cardiovascular disease and insulin imbalance. Catabolism is part of metabolism that breaks down molecules into smaller units to generate energy and simultaneously takes measures to conserve energy. Stress, such as during weight loss program, can put the body into the catabolic state, in which the body can experience reduced metabolic rate, reduced calorie expenditure, lower energy levels, which result in binge eating because of perceive hunger, and weight gain in the form of fat. A Catabolic state can be characterized as having a high cortisol (a catabolic stress hormone) level and a low testosterone (an anabolic hormone) level. Conversely, in the anabolic state, the body experiences muscle maintenance or growth, normal metabolic rates, and weight loss in the form of loss of fat. The anabolic state can be characterized by relatively low cortisol levels and high testosterone levels. 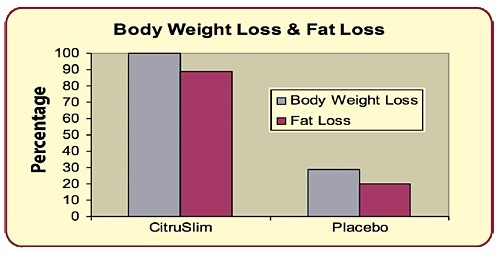 CitruSlim™ is an innovative nutraceutical ingredient for healthy weight management. CitruSlim™ is a proprietary blend of Citrus flavanone-O-glycosides and Eurypeptides from Eurycoma Longifolia that can promote an anabolic state, reduce cortisol, activate AMPK, reduce triglycerides, and help balance blood glucose levels. CitruSlim™ can promote healthy weight loss by helping dieters maintain high energy levels during weight loss programs, prevent the body from storing fat, reduce appetites, prevent binge eating, and help stop the “yo-yo” diet effect. Citrus fruits are well known for providing ample amounts of vitamin C and bioflavanones that have many health benefits. Major flavanones and flavones found in citrus fruits are eriocitrin, neoeriocitrin, narirutin, naringin, hesperidin, neohesperidin, poncirin, rutin, diosmin, and rhoifolin. These flavanones can help to activate AMPK, reduce triglycerides, reduce adipose fat, and maintain healthy cholesterol and blood sugar levels, and healthy weight management. Eurycoma longifolia is a powerful adaptogen and is used as a traditional anti-aging remedy to help older individuals adapt to the reduced energy, mood, and libido that often comes with age. Eurycoma contains a group of small peptides referred to as eurypeptides that are known to have effects in increasing energy levels and enhance testosterone in both men and women. Eurypeptides additionally help to increase muscle size and strength, improve overall well-being, accelerate recovery from exercise, enhance weight loss, reduce cortisol level, and reduce symptoms of fatigue. Naringin, rutin, and neoericitrin found in Citrus Flavanone-Oglycosides have been shown in research to activate AMPK (adenosine monophosphate-activated protein kinase), along with related fat burning gene signals, thus preventing the build up of fat in liver cells. AMPK is a pivotal cell enzyme required to orchestrate the burning of fat and sugar. AMPK plays a central role in regulating healthy glucose and lipid metabolism and energy production. AMPK activation can prevent abdominal fat accumulation, blocks fatty acid synthesis, and augments fatty acid oxidation. Activation of AMPK also leads to the activation of the glucose transporter GLUT1 in all cells, increase glucose availability for energy production and promotes glycolysis. In a randomized, multi-center, placebo controlled study, 107 patients with metabolic syndrome with non alcoholic fatty liver disease were given either placebo or 650 mg of Citrus Flavanone-O-Glycosides or placebo twice a day for 120 days. The Citrus group showed significant reduction of fasting plasma glucose, total cholesterol, LDL cholesterol, triglycerides, and then the increase of HDL cholesterol. Hepatorenal index was significantly reduced by 46%, accompanied by the reduction of hepatic ultrosonographic patterns of steatosis by 99%. This suggests Citrus Flavanone-Glycosides help improve both liver function and inflammation as confirmed by reduction of TNF−α and CRP. Eurycoma Longifolia contains a group of small peptides referred to as Eurypeptides that are shown in research to activate CYP-17 enzymes and plays essential role in androgen biosynthesis. More particularly, the Eurypeptides help to promote anabolic state by maintaining low normal cortisol and high normal testosterone levels during stressful period. Eurycoma help to increase energy, reduce fatigue, and inhibit cortisol spike during weight loss program, making it easier for dieters to control their appetite and prevent the body from increasing fat storage. 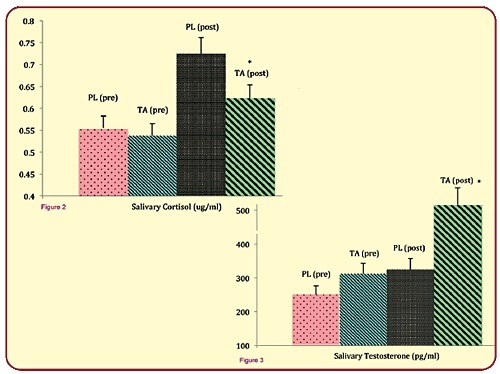 64 subjects (32 men and 32 women) with moderate stress level were randomized to receive 200 mg/day of Eurycoma Longifolia extract or placebo for 4 weeks. At the end of treatment, Eurycoma group showed significant improvements for Tension (−11%), Anger (−12%), and Confusion (−15%) compared to placebo. Stress hormone profile (salivary cortisol and testosterone) was significantly improved by Eurycoma, with reduced cortisol (−16%) and increased testosterone (+37%). Eurycoma is effectively in restoring stress hormone profile and improving psychological mood state, shielding the body from the detrimental effects of “modern” chronic stress, which may include general day-to-day stress, as well as the stress of dieting, sleep deprivation, and exercise training. 50 moderately overweight men and women were recruited to participate in a 6-week program of stress management, nutrition intervention, exercise, and CitruSlim™ supplementation. 40 were given 200mg of CitruSlim™, and 10 were given placebo. All subjects followed a moderate calorie-restricted diet based on resting metabolic rate (RMR), plus a moderate exercise program (5 d/wk including aerobic & strength training), and stress management techniques (daily). At the end of the 6 weeks trial, the CitruSlim™ group had a 95% completion rate, while the placebo group had an 80% completion rate. Suggesting that the program was easy to follow and not overly restrictive. This is much higher compare to other diet programs, such as 50% completion rate for Atkins and Pritikin diet, 65% completion rate for weight watcher and Zone diet. Participants in the CitruSlimTM Group showed significant body weight loss of an average of 2.7kg. 2.4kg is in body fat loss, suggesting 87% of the total weight loss is body fat loss. On the other hand, participants in the placebo group do not show significant body weight loss (0.78kg) or body fat loss (0.55kg). 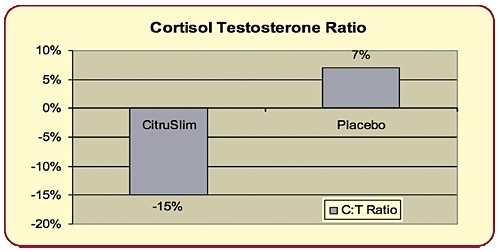 The Cortisol Testosterone ratio decreased significantly by 15% for the CitruSlim™ group vs. a 7% increase for the placebo group. CitruSlim™ promotes an anabolic state by maintaining normal low cortisol levels and normal high testosterone levels. The higher testosterone levels also contribute to higher energy levels and reduced fatigue, leading to a higher completion rate for the weight loss program. 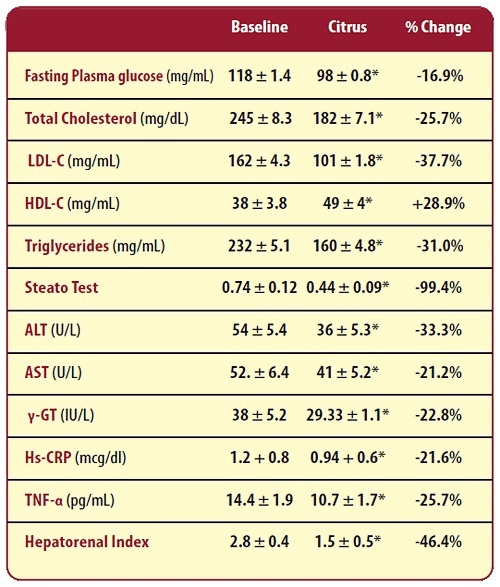 At the end of the 6 week trial, the CitruSlim™ group showed significant reduction of total cholesterol by 17% and LDL by 15% vs. no change for the placebo group.